Encouraging Pro-Environmental Behavior: What Works, What Doesn't, and Why examines the main drivers of human behavior related to environmental sustainability and how we can encourage environmental behavior change in humans. 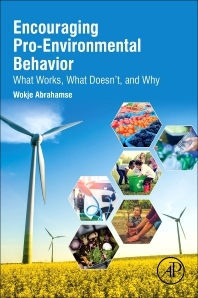 The book explores the underlying barriers and enablers of environmental behavior and outlines key theoretical advances from psychology to improve understanding. It then uses theory-based research in the development of behavior change interventions to critically evaluate empirical evidence on the effectiveness of those interventions. This book will help inform and improve the success of behavior change initiatives to mitigate climate change. Wokje Abrahamse is an internationally recognized scholar in environmental behavior change research. Her research focuses on the human dimensions of environmental change, applying psychological theories to better understand the barriers and enablers of engagement in environmentally friendly behaviors, such as attitudes, social norms, and habits. She also examines the effectiveness of interventions to encourage the adoption of environmentally friendly behaviors, such as energy conservation and travel mode choice.